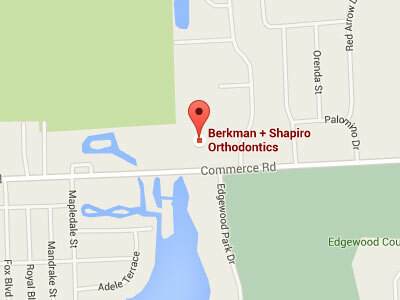 Every day, the Berkman & Shapiro Orthodontics team creates beautiful smiles using cutting edge technology alongside a family-centered approach. We communicate honestly and take pride in our reputation for expertise and affordability. We love improving smiles and lives and find that the work we do is life-changing for us as well as our patients. Since 2004 we’ve helped thousands of patients from Commerce, West Bloomfield all over southeast Michigan experience superior orthodontic treatment with braces and Invisalign. To provide the highest quality orthodontic treatment and create beautiful, healthy smiles in a positive, warm, and caring environment, where each person is appreciated, expectations are exceeded, and service is unsurpassed. The current office location, at 8898 Commerce Road in Commerce Township, opened in 2004 and is presently one of the most technologically advanced offices in the world! The office was custom-designed by Drs. Berkman and Shapiro, with precision, efficiency, and patient convenience in mind. Our reception area has Wi-Fi, a coffee bar, charging stations for your mobile device, and a library of books and magazines. Although you won’t be waiting long (on average we seat our patients between 3 minutes early and on-time), we hope you make yourself at home while you are there. All of the orthodontic equipment is state-of-the-art, and cutting-edge technology is part of every step of treatment. All patient records are computerized, and we utilize virtual treatment tools to demonstrate proposed treatments to our patients. Additionally, all of our x-ray imaging equipment is completely digital. This means every image taken in the office is taken without film and stored directly on a computer. This way, adjustments and enhancements may be performed virtually and are easy to understand. Computerized panoramic and cephalometric x-rays provide unparalled exactness, allowing the doctors to best determine the specific needs of each patient. Most importantly, our technologically-advanced digital imaging system exposes patients to only a fraction of the radiation that they would receive from a traditional x-ray unit. Another exciting feature of our state-of-the-art orthodontic office that you will notice is that there are no patient charts! All patient information is entered and stored on a computer, and a flat-screen monitor is attached to each chair, allowing access to all patient information with the press of a button. Photographs, x-rays, appointment information, financial forms, etc., may all be sent electronically to patients, parents, and other doctors upon a request. Of course, we still are equipped to send things through the regular mail, too! The office is committed to continually evolving in order to serve our patients in the best way. We invite you to let us know if there is any way we can make your experience with us even more rewarding. Our office hours are designed with your busy schedules in mind. We know your time is valuable, and want to make sure that your experience with us is positive and fun. In addition to offering convenient hours during the weekdays, we also offer appointments during evenings and on weekends! We do a tremendous amount of “behind-the-scenes” work to ensure that you are seen on-time and your appointments are as efficient as possible.